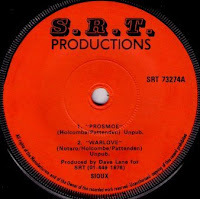 Welcome to amateur hour...Issued on SRT which released countless “private” affairs throughout the 70s, here is a 4 track EP by Sioux. It must have been recorded as a demo and they probably touted it around to get gigs or perhaps a record contract...The overall effect is a bit like a prog era Swell Maps . Prosmoe could have been a 60s garage band attempt to re-write Gloria, whilst Warlove sports some Wah Wah guitar and sounds more in tune with the 70s. Still the four tracks find a band stuck somewhere between a Hard Rock place and ineptitude. Side 2 is pretty much more of the same...Again, any info on the band itself? Very nice. Your blog makes me wish I lived in the UK and had a chance of just stumbling upon records like these. Thank you very much Mr Purepop! I'll have those songs on repeat for the rest of the day.